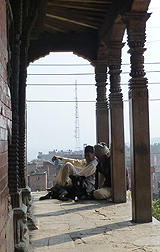 The ancient City of Kirtipur 'City of Glory' is situated high on a hill about 4 miles south east of Kathmandu, it is separated from Kathmandu by the Bagmati River. The highest most point of the town is 1524 meters, which for UK visitors is almost 200 meters taller than Ben Nevis. 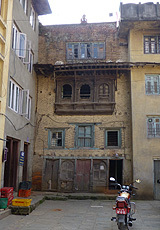 The town has much history, the most famous of which is 'The Battle of Kirtipur', a very vicious and bloody battle involving noses and lips being cut off, which occurred in 1767 when Nepal was conquered by 'The Ghorka'. Some of the swords used in that Battle are hanging on the sides of the Bagh Bhairava Temple, the town's centre piece. It is now centre of the Newer culture. The Newer people are said to be anti Monarchy and in 2006 when Nepal overthrew the then King, it was here that most demonstrations, peaceful it should be said, took place. Upon arriving there, the first thing that struck me was there were hardly any Tourists, the only one I saw was german chap who had a personal Taxi Driver / Guide like myself. So if you want to see history in relative peace, this is a good place to go. The town is made up of very narrow Streets and around every corner you seem to come across another landmark such as a Temple, Statue and the Old Palace itself. Unlike Kathmandu, the shops are more of the local nature. Walking along you'll see many Tradesmen and Craft persons going about their business in their doorways or on the Street themselves. A popular trade is with the women drying Rice with rakes and feet on huge blankets draped on the ground. You'll get used to weavering between the various Poultry on the way as well. The quietness and sense of age are quite profound. A very good viewpoint is from the Uma Maheshwor Temple as is from Chilancho Mahabihar Stupa. The town is situated quite close to the Tribhuvan University, many Students are attracted to take residence in Kirtipur owing to lower rents and a slightly less cost of living in general. If a trip to the town is not included in your Itinerary it is well worth getting a Private Taxi / Guide to visit the place. The area id full of narrow streets and lanes, easy to get yourself lost.